The World Wide Web Consortium (W3C) Web Accessibility Initiative is designed for better navigation for all users with a diverse range of physical and mental capabilities. Unfortunately, while the latest web tools may advance technology, they are sometimes designed to prevent some people with disabilities from using the Internet. The Americans with Disabilities Act (ADA) goal is to provide “people with disabilities to have the same opportunities as everyone else to participate in the mainstream of American life—to enjoy employment opportunities, to purchase goods and services, and to participate in State and local government programs and services.” To achieve this, the ADA requires all federal-funded agencies must have websites that meet Web Content Accessibility Guidelines (WCAG) or are 508 Compliant. The government is starting to take aggressive action against institutions that are not adhering to these accessibility standards. Such agencies are considered in direct violation of the law, and will have to face serious legal consequences. What Kind of Agencies Does This Apply To? 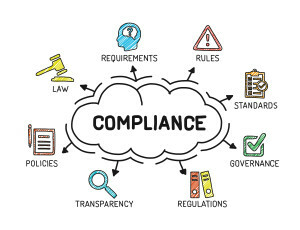 What Does it Mean to Be 508 Compliant? Your website needs to be accessible to anyone with a disability. The ADA defines anyone with a disability as someone who has “a physical or mental impairment that substantially limits one or more major life activities, a person who has a history or record of such an impairment, or a person who is perceived by others as having such an impairment.” Government funded agencies need to present their website in a way what gives everyone the opportunity to access technology without any obstacles or barriers thus, providing equal opportunity to all users. How Does It Work and What Does My Website Need? There’s a specific source of code that people with disabilities can access. This code will have clear visuals by providing an alt text for descriptive captions. Color is forbidden as a navigational tool, because users who are color-blind will not be able to use this feature. Video needs to have synchronized captioning and audio needs to be supplemented with transcripts. Your keyboard must be labeled accordingly with headings and other elements that will make it easy for users who can’t use a mouse. For users who cannot use the keyboard and heavily rely on a screen reader or other types of technology to access information, special applications need to be implemented so that the user can fill out online forms, download PDFs, and other types of documents. Many website may have repetitive links in order to make the browsing experience easier, but for users with disabilities, this could be a hindrance. As a government-funded agency, your website must also have a built-in “skip navigation” link that will help users navigate to web page they’re looking for. I’m Being Sued for Not Being ADA Compliant. What should I do? 1- You will get a letter or notice telling you to freeze editing or changing anything on your site. 2- You will be asked to backup your site and send it to your attorney along with an affidavit stating that no changes were made to the site since the date that you have had the notice. 3- After you send in the affidavit, you can begin making changes on the site and make it ADA compliant. If you have a full html site or a content management system (CMS) such as Joomla, WordPress or Drupal, we can work them as well as other systems. Is Your Website 508 Compliant? We have already received urgent requests for help because websites are not ADA compliant. Approximately 95% of websites DO NOT meet these requirements. If you’re not sure that your website is ADA compliant and meets the W3C’s accessibility requirements, contact Optimum7 as soon as possible and we will assist you in shaping your website to meet all the WC3’s accessibility standards.